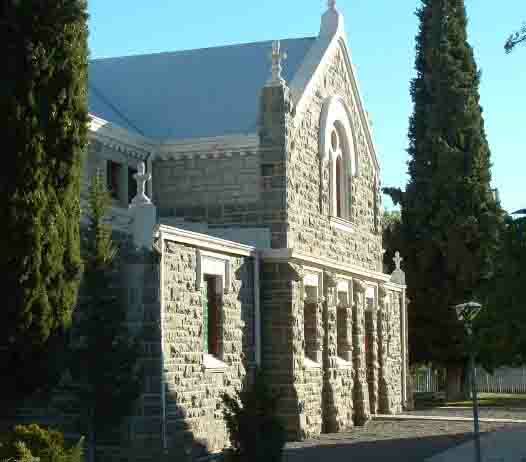 Laingsburg is a small town in the middle of the Karoo about 300 kilometres north of Cape Town. 31 years ago on the 25th January 1981 this town was hit by one of the worst floods that had occurred in the area in more than a 100 years. Bridges, houses and people were swept away when the river came down in flood. The small town was devastated. During the SA school holidays we visited Laingsburg to see what had happened in the town since the floods occurred. The natural place to start is the river and there one can still see after 23 years the devastation of the floods. The river banks and bottom have been scoured away and all that is left are rocks on the river floor. Vegetation has grown back but this cannot cover the damage done to the river bed. When one looks at the small stream running under the road and railway bridges one cannot imagine that the water actually rose and went over the top of the bridges washing them both way. The main road through the town had water two metres deep running down it at the height of the flood. 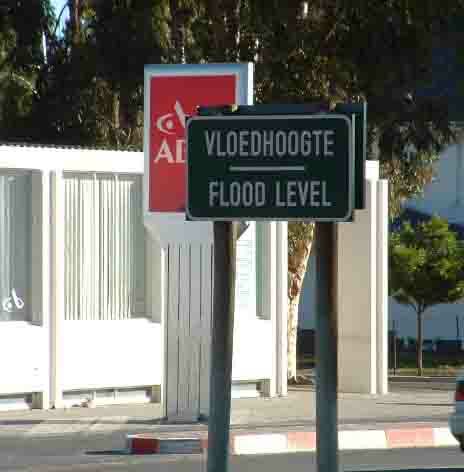 As a remembrance the local authorities have placed a road sign in the middle of the road showing the level of the water at the height of the flood. Walking down the road towards the river one cannot imagine that the water could have flooded the town at all. The Dutch Reformed Church which was flooded still stands there today with a commemorating headstone for their minister who was one of the victims of the flood. Laingsberg is a lot more modern these days, as many new buildings have been erected since the flood. As you enter the town from the north you come across a large truck stop with a modern garage. Next door is the hotel with a restaurant where one can get a large plate of Karoo lamb for a very reasonable price. For those who don't know “Karoo lamb” is the most tasty mutton one can buy in South Africa. The sheep feed off the Karoo bush which gives the meat this lovely flavour. It was rather funny visiting the local petrol garage for petrol. I asked the attendant what there was that was worth seeing in the town and his reply after a moment of thought was “Nothing”. After a drive around the small town I had to agree with him. The town has the N1 highway to the north running through it and caters for the passing trade. In 15 minutes I counted about 30 large trucks moving through the town in both directions with many of them stopping for petrol/diesel at the truck stop. 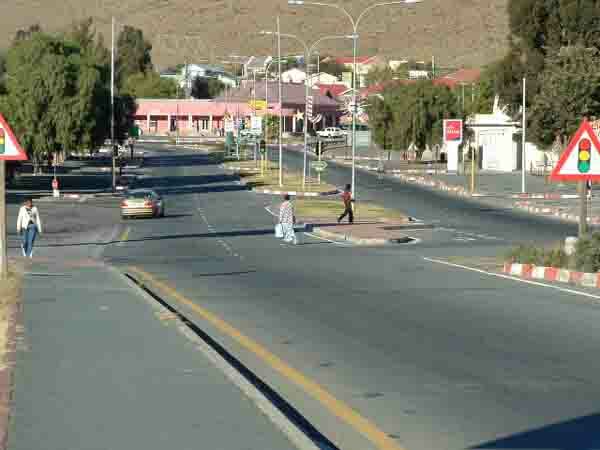 For long distance drivers Laingsberg is a rest stop as it is a three hour drive from Cape Town and the next large town along the highway is Beaufort West which is a further 200 kilometres to the north on one of the most boring roads one can drive on. It's one of the main reasons there are so many accidents along this stretch of road. 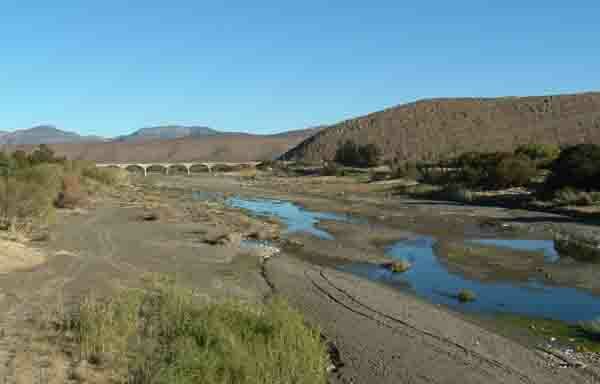 Although the town is a typical Karoo town it is surrounded by lots of natural beauty. To the south the rock formations that occur on the side of the road are very interesting. The mountains look as is they have been pushed up like a scrum and have been frozen in time. 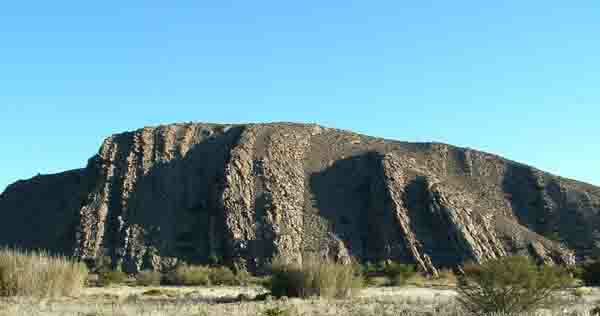 The ridges are rocky and there is a white line running along the ridges for miles. When I asked about it, I was told that it was formed when the mountains were formed millions of years ago at the time when Gondwanaland still existed. Laingsberg is a farming district where the main products are sheep and wool and these days there is an increase in game farming Along the Fraserberg road I to the south east of Laingsberg are some interesting farms. They grow onion seeds and are apparently the only place in the world where onion seed can be produced. Apparently pumpkins are also grown there also just for their seed. A journey through this part of South Africa to see the beauty of the mountains and the strange rock formations along the way is a must. Next time you visit SA take a trip into the Karoo.